The 2015 annual World Ride has accomplished 19,258,351km, a lot of miles for an over the weekend event. Launched in 2008, Harley Davidson Motor Company and the Harley Owners Group came up with a simple idea to express the passion that united motorcycle riders from all over the world, regardless of age, location or even brand of motorcycle. Every year H-D riders hit the road to participate in this heart-warming event. This year H-D Singapore saw an overwhelming response of participants. The ride was to the Big Splash at East Coast Park. 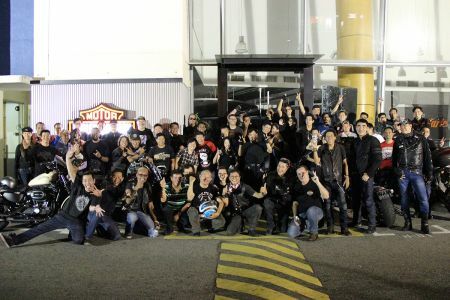 This optional ride organized by H-D Singapore was a head start for riders to clock their mileage for the World Ride. H-D Singapore also added in a prize for the rider that achieved the furthest mileage. This year’s award went to Mr Anthony Elvey, together with his H-D Breakout CVO. Managed to travel 812km. His adventure was a ride to Johor Bahru , Malaysia. Mr Anthony went around the roads of Johor in search for open roads to share the passion of motorcycling. H-D Singapore welcomes all riders for this event, and we hope to see you all again next year!